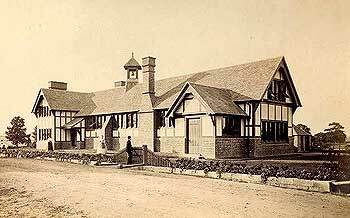 After extensive planning applications taking a number of years, a third classroom was added to the 1867 original building in 2000. Being a Grade II listed building, the construction of the extension involved complex arrangements. The bricks had to be handmade and the bonding had to match that of the existing construction exactly. The pitch of the roof also had to be in keeping. Access to the classroom had to be made from the later covered way part of the school, so the original building was not affected. Once the fabric of the building was in place, the internal fixtures were purchased to match those in the rest of the school. 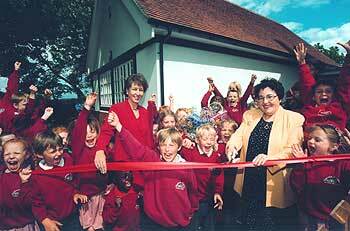 The Leighton Buzzard Observer carried a feature about the new addition to the school in June 2000"
"A new £93,000 classroom was officially opened at Husborne Crawley last week. Sandra Bailey, the council's principle planning officer said, "It certainly was a difficult issue to tackle. We had to add a classroom while retaining the integrity of the building, also bearing in mind that it is in a conservation and green belt area. We worked very carefully with our historic buildings officers, English Heritage, the architects and Anna Sims, the Headteacher, to ensure it met all the requirements".